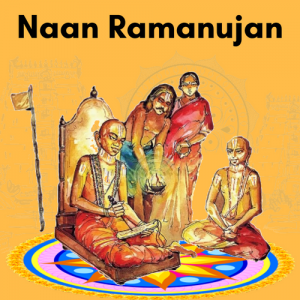 In the fourth Paasuram (yEdu nilatthil—-), AzhwAr invited Kaivalyam seekers to join his ghOshti to sing PallANDu. They responded positively and stated their fitness to join and were accepted. 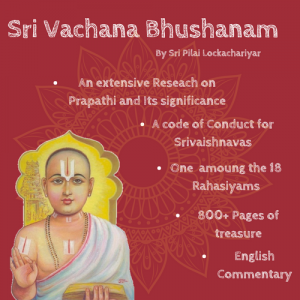 The erstwhile Kaivalyam seekers advanced their cases this way: “We are Sri VaishNavAs. 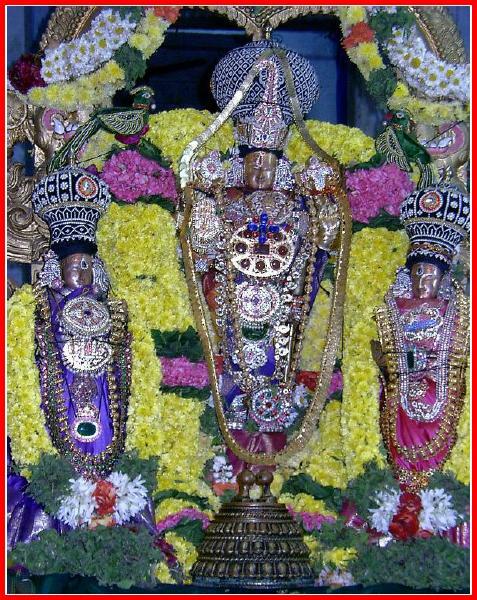 Following the Aagama prAmaNyam of wearing the VishNava chinnams (marks), we have attained VaishNava Svaroopa satthai. As a result, our desire for goals other than seeking the Lord have ceased to interest us. Our leaning now is only for matters dear to VaishNavAs (abhinivEsam in VaishNava anukoola vishayams). Therefore, we are confident that we will gain Moksham. 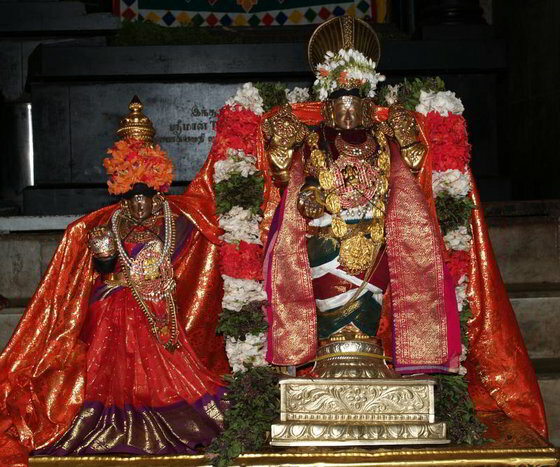 We have the mudhrai of Lord Sudarshanar, who is more lustrous than chandran and Sooryan, on our right shoulder. We have thus Taapa SamskAram (tapta chakrAnkaana, the important VaishNava dheekshA) recommended by the AagamAs on our right shoulder. Therefore, we follow the margam prescribed for VaishNavAs. 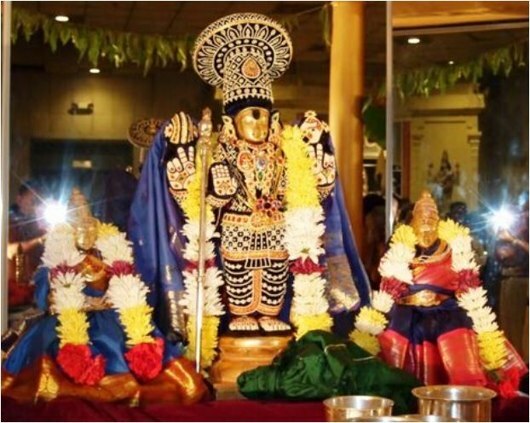 For generations, we have been observing the Dhasya Vrutthi unique to VaishNavAs. To that extent, we sing PallANDu to the Lord. You may ask why we do so. When we think of the heroism displayed by Lord KrishNa in the war with the wily BhANAsuran and the way in which our Lord whirled the ChakrAyudham to cut off the 1,000 arms of the asuran and made his blood flow all over the battle ground. 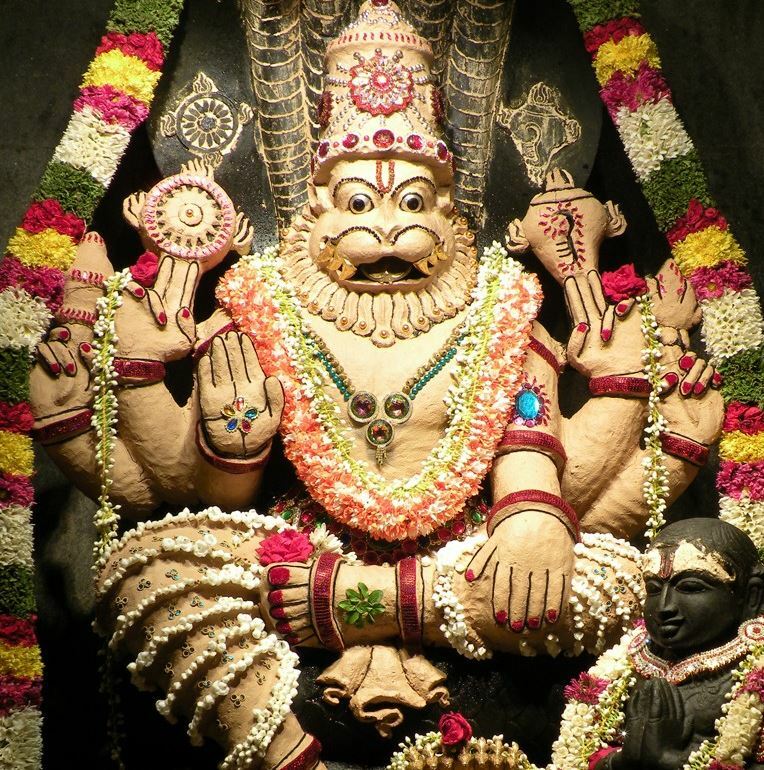 When we think of that Veera SrI of the Lord, we are moved to sing PallANDu to our Lord. 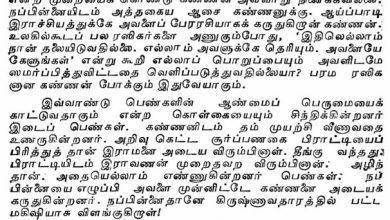 Former Kaivalyam seekers state that they are VishNavAs with Chakra laanchanam and have been performing kaimkaryam for generations to the Lord (VaishNavOchitha maargEsTirayA nishtayA varthamAna:santhAna sasanthAna roopENa saanubhandhikA:). We perform DhAsya Vruthti (DhAsya Vrutthim kurvAma:). We are thus DhAsAs to the Lord with Veera SrI, who cut off the thousand arms of BhANAsuran in the battle field and as such singing PallANDu to such a Lord is but natural to us as VaishNavAs. SrEshta Janmam as VaishNavan results from Svaroopa Jn~Anam blessed by the clear comprehension of Moola Manthram.